Archbishop Dominique François Joseph Mamberti is the Secretary for Relations with States in the Roman curia. He was appointed Secretary for Relations with States by Pope Benedict XVI in September 2006. Previously, he was appointed by Pope John Paul II to be titular archbishop of Sagona, apostolic nuncio to Sudan, and apostolic delegate to Somalia. Born in Marrakesh, Morocco, Mamberti went on to earn academic degrees in civil and canon law and was ordained a priest of the Diocese of Ajaccio, France in 1981. During his career in the diplomatic service of the Holy See, he has worked in Algeria, Chile, Lebanon, and the United Nations in New York. 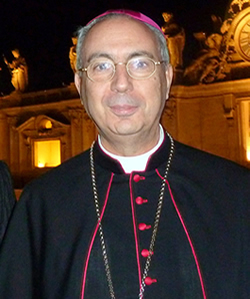 Archbishop Mamberti is a leading authority on Latin America, the United Nations, Africa, the Middle East, and Islam.